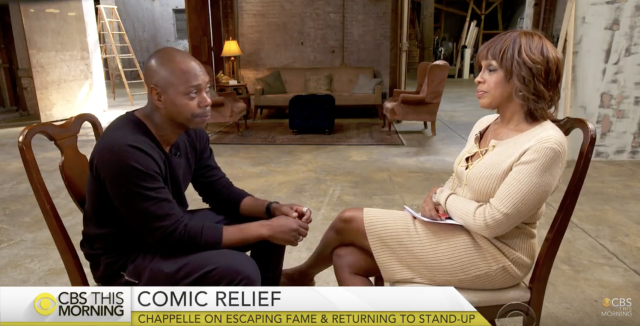 Comedian Dave Chapelle, a Washington, D.C. native who now lives in Ohio, sat down with Gayle King, in his hometown on the eve of his Netflix comedy show and talked about everything we wanted to know since he left the spotlight. Dave opens up about fame, money, and Key & Peele getting credit for his style of comedy. Chappelle has been making people laugh for 30 years. His career exploded after two hilarious seasons of "Chappelle's Show" on Comedy Central, but he suddenly abandoned it at the height of his success. While he often shies away from interviews, Dave sat down with Gayle King for an in-depth conversation on "CBS This Morning." In a rare interview, comedian Dave Chappelle tells "CBS This Morning" co-host Gayle King about why he is connecting with a part of his family history at Allen University in Columbia, South Carolina. His great-grandfather, Bishop William David Chappelle, was a former president at the university. Chappelle talks about his "Saturday Night Live" appearance last November: SNL's first new show after President Donald Trump was elected into office. this article racist against Canadians! not available in Canada?? seriously? if you want to watch these outside of your allowed region, change tube to pak in the address bar. works on every youtube video. What a nice guy Dave is. I hope he comes to the Edinburgh Festival one day.